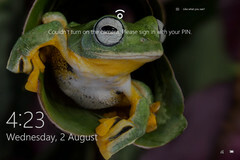 The latest driver update from Microsoft has stopped Windows Hello from activating the IR camera needed for facial recognition on some Surface Pro 4's. However, the problem with the screen vibration bug might also have been fixed. UPDATE: The Windows Hello bug has been fixed, with our Surface Pro 4 no longer experiencing the issue. The Microsoft Surface Pro 4 is a popular device amongst those who own them, mainly thanks to having a full U-series processor experience in an extremely light and portable form factor, as well as additions such as the Surface Pen. But sometimes the experience is let down by strange firmware and driver issues, such as problems at launch with connecting to external displays via the Surface Dock, or battery drain when in standby. OnMSFT has collated a few of the unsolved issues which users report on various places on the internet. The newest of which is 'Windows Hello' failing to activate the IR camera needed for facial recognition. A Surface Pro 4 belonging to one of our editors has just developed this problem in the last day or so. One solution that OnMSFT quoted was to roll back the 'Surface – System – 7/21/2017 12:00:00 AM – 1.0.65.1' driver, which appears to allow Windows Hello to activate the camera properly. Alternatively, login is still possible via traditional methods. Another issue that OnMSFT has reported on is a screen jitter, that can be best described as the entire on screen image 'vibrating.' While complaints of this jitter have been showing up on a small number of devices for much of the Surface Pro 4's life, it became a lot more frequent in early 2017. While there has been speculation of overheating damage causing the issue, we aren't so sure of that ourselves. Our Surface Pro 4 developed the issue around May this year, and we could reproduce it easily by watching a video using Edge browser, after which the jitter would come and go for the next 30 to 60 minutes. When we used other browsers to view videos the jitter never started, even though CPU usage was higher and fans were running. This troubleshooting made us suspect an issue with GPU acceleration, but we weren't able to prove this, and the shaking stopped on our device after the late July driver update. Fortunately for Microsoft and owners of the Surface Pro 4, this newest Windows Hello issue appears to be software based and therefore can be fixed more quickly, unlike the backlight bleed and thermal throttling problems associated with the Surface Pro 2017.